We were in Hawaii, and our hotel room television only had a handful of viewable channels. One of those channels happened to be Nickelodeon, and while we had it tuned in an episode of SpongeBob Squarepants came on. After watching it, both my wife and I understood why everyone loved the show: it was simple yet hilarious. It reminded me of Ren & Stimpy, though SpongeBob is much more grounded in a community aspect, for they live in a specific town called Bikini Bottom, and they have consistant jobs and friends. It must have been a fluke that the episode I had originally seen was one of the not-so-great ones, which I guess could be a good thing because now I get to discover a whole ton of episodes without having to wait for new ones each week. TiVo has been grabbing a bunch, and I even just got to see the SpongeBob Squarepants movie the other day, which was a fantastically enjoyable film! And now I'm here to tell you about SpongeBob's latest DVD which I just watched, titled Spongebob's Atlantis Squarepantis. Unfortunately, and I hate to say this, but Atlantis Squarepantis is not one of the better Spongebob stories out there. If I had seen this as my followup Spongebob experience, I would not have been eager to see more. The story is bland, and the episode is plagued by many forgettable and not-to-funny songs. Thankfully, the disc contains six other 15-minute episodes (technically each one is less than 15 minutes since they have to leave room for commercials when airing on television), and most of those are pretty good. The plot of the Altantis Squarepantis episode sees SpongeBob and Patrick stumbling upon one half of an Atlantian seal while they are doing their typical goofing off. So the pair heads to the local museum to see if they can learn more about it. Well, Squidward, Mr. Crabs, and Sandy all just happen to be hanging out there, and after Squidward combines SpongeBob's half of the seal with the half in the museum, a magic bus appears out of nowhere. This bus runs on the power of song, so our characters sing an easily forgettable song while the bus magically drives itself to Atlantis. Once in Atlantis, our characters meet King Neptune, who takes them on a tour of the city. What follows is very Willy-Wonka like, with each character seeing a room they love and opting to stay behind while the others carry on. And for some reason they each need to sing a song before doing so. The main problem up to this point is there has been no conflict, no obstacles to overcome, and no problems to solve. One conflict does finally show up which forces SpongeBob and gang to flee the city, but it occurs so suddenly and is over so quick that it feels more like an afterthought than a plot point. There are a few extras on the DVD, such as an Inside the SpongeBob Animation Studios featurette and a Behind the Pantis: The Making of "Atlantis SquarePantis", but neither are really anything special. Most of us have seen plenty of featurettes about how animation is made, and these don't really reveal anything that hasn't already been shown before, so it would probably only interest kids who haven't yet seen these types of making-of featurettes. 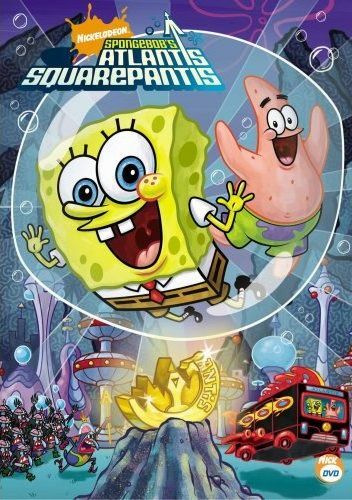 SpongeBob's Atlantis Squarepantis was released by Nickelodeon on DVD starting November 13, 2007.